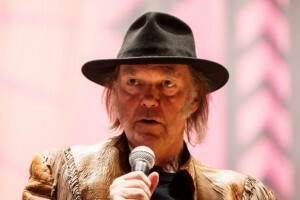 Singer Neil Young speaks during a press conference for the Honour the Treaties tour in Toronto, Sunday January 12, 2014. Neil Young announced he will perform a concert July 3 in Edmonton to benefit the Athabasca Chipewyan First Nation Legal Defense Fund. Young will be joined at Rexall Place by Canadian band Blue Rodeo, according to Global News Canada. Young has been a vocal supporter of the Athabasca Chipewyan First Nation in its fight to stop oilsands development. 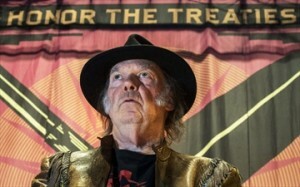 Last year, he held similar Honour the Treaties concerts in cities across Canada, including Calgary, the article stated. In 2013, Young came under fire for comparing Fort McMurray, Alberta to the Japanese city destroyed by an atomic bomb in 1945. 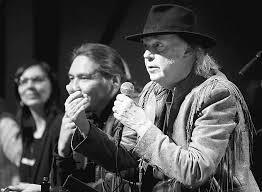 Chief Allan Adam welcomed news of another benefit concert by Young. 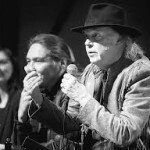 “With the support of Neil Young and fans we are creating more accountability from our governments for the safe guarding of our lands, rights and future generations in Alberta, Canada and beyond,” said Adam, in a release. Tickets for the Edmonton concert start at $45 and go on sale May 1. A message from Neil, along with his address to the press before the Calgary show, specifically to the editor of the Calgary Herald. Thanks to my friends in the First Nations. Thanks to my crew, Thanks to all of the Canadians who supported our efforts to enable justice and truth for the First Nations living in Canada. Our journey across the great expanse of Canada reveal…ed the beauty of the people and the land once again and brought back the old feelings of home. To the leaders of Canada I say keep our word. Live up to the truth. 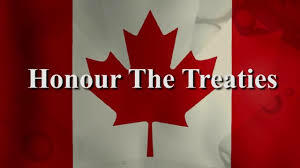 Honour the treaties. To the foreign and domestic oil companies in our north, I say clean up your mess. Talk to our First Nations and come to agreements to allow what you plan to do on their land, as it is represented in the treaties our forefathers reached with our First Nations. PEACE. 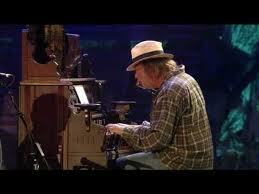 Neil Young, Canadian citizen since 1945. Was it worth the 15 minutes of fame? An insightful blog posting by Angelina Pratt – a beneficiary of Neil Young’s 2014 Canadian tour and member of the First Nation Athabasca Chipewyan. She has mixed feelings about everything that happened with Neil and the tribe and publicity and treaties and the anti-oil message. She expresses herself in a way that brings new perspective. The blogger states her intent is to stay true to her core being. “What this means to me is to stand in integrity,” she said.